SummitbusinesscustomersfeaturedinMainebiz - Summit Utilities Inc.
“We first looked at this 30 years ago, and today it has become a reality,” says Drechsel of the switch from oil to compressed to liquefied and now to pipeline natural gas. While he would not reveal the savings the magazine-grade paper mill expects from the changeover, he says even a savings of 10% would have been more than enough to make the investment. But by his estimates, the mill could see a much better return than that. Drechsel says natural gas will cost about one-third less than oil on a per ton basis. Still, he’s opted for a dual-burner system, with the memories of oil price fluctuations and natural gas shortages last winter still fresh in his mind. “We’ll keep our capacity to burn oil so if the market does change and fuel oil becomes less expensive, we could burn it. So we’re not walking totally away from oil,” he says. “We have a lot of inquiries for quotes for gas conversions every day. It’s like the gold rush right now. Everyone is getting in on it,” he says, adding he expects the trend to continue for several more years. While natural gas promises cheaper fuel bills, deliveries uninterrupted by snow piles and a cleaner alternative to oil, it also can dramatically impact the bottom line of both homes and businesses. When Katahdin Paper Co. closed its Millinocket mill in 2008, it cited record oil prices that had doubled the mill’s fuel costs. Drechsel says his company’s use of natural gas has made the biggest favorable financial impact on his mill over the past five years. Energy is the biggest factor for the mill, for both heating and electricity. 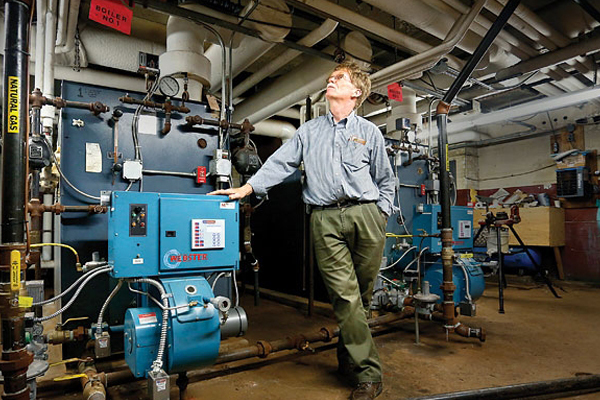 Right now, the mill is only using natural gas for heating and not to generate electricity. The mill first converted to liquefied natural gas, then to compressed natural gas and now is moving to pipeline natural gas. He’s not alone in that sentiment. Two other Maine paper mills, Sappi Fine Paper’s Somerset mill in Skowhegan and Huhtamaki Inc. in Fairfield and Waterville, have also signed on as anchor customers for the Kennebec Valley natural gas pipeline now under construction by Augusta-based Summit Natural Gas of Maine, which expects to complete its $350 million, 68-mile main pipeline from Augusta to Madison by mid-October. Summit and Maine Natural Gas of Brunswick are competing head-on to supply gas to state and municipal buildings and to homeowners in the Kennebec Valley and elsewhere, with the aim of reaching both commercial and residential customers. Maine has no territories for the suppliers, so they compete in the same markets. The other two approved natural gas distributors in Maine, Unitil and Bangor Gas Co., also are scooping up customers in Maine’s major cities. There’s even anecdotal evidence from real estate agents that buyers are expressing preferences for homes with natural gas.